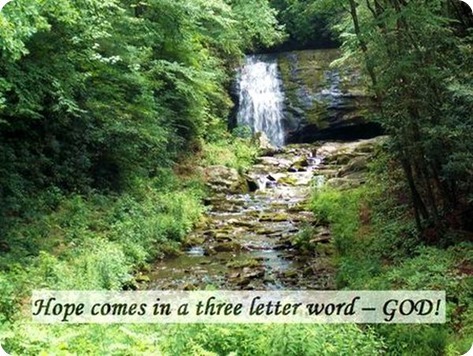 Hope comes in a three letter word – GOD! I have an ongoing discussion with myself. Sometimes the discussion gets so intense it even becomes verbal. While it may be a discussion I could invite others to join me in however because it is so personal to me and because there is no right or wrong answer it will remain between myself and myself. The discussion centers around this question: Which is the greater need/blessing Hope or Peace, or are they different names for the same “ground level blessing” coming from my relationship with God? No matter how intense it becomes or how futile it appears to be the discussion is of course of no consequence because of the fact that when God blesses us his blessings are perfectly formatted for the point of our greatest need. However, out of the seemingly pointless discussion have come the thought that both are workings of God’s Love given to us by the Holy Spirit through our relationship to Jesus. Our greatest need is not Hope, it is not Peace, it is not Love, our greatest need is a three letter life changing word – GOD! God’s greatest gift/blessing is God. Since God is far beyond our ability to comprehend we experience his presence in ways we can relate with. At the risk of sounding unsophisticated and unbecoming of God – God is the complete package. My own testimony is this… At this time in our lives because of the important decision facing us (Patti and I) our greatest need is the Hope (remember Hope is not wishful thinking) that whatever the outcome is God will be intimately involved in the ultimate decision and because of verses like the one above I can draw Peace out of Hope because they reassure me that God is with both of us individually and together. And out of that I know whatever happens will be blessed by God. And the better news is what God does with us and in us he does for you as well.